So I am about to head back to the UK for a few weeks to say hi to the parental units, catch up with friends and work really antisocial hours to keep in touch with the US. 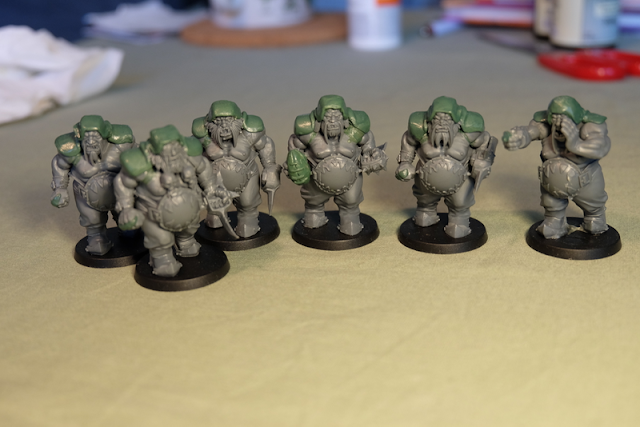 This hard deadline had held me back from taking on any major projects (like painting my next Blood Bowl team!) but it has pushed me to give painting up some rank and file miniatures a go. Looking back, it really is pretty remarkable to me what I have managed to get done in a week. Now there are is a bit of a disclaimer here. 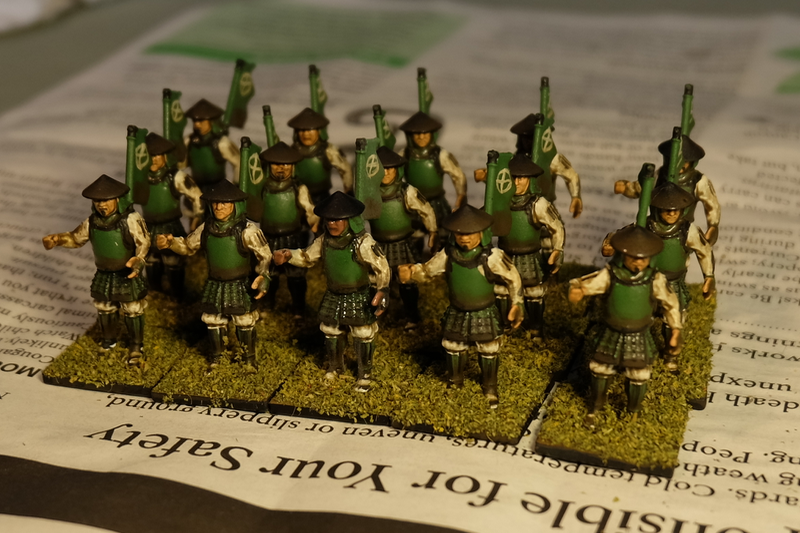 Firstly the Ashigaru were already primed Green, taking out a lot of the work, secondly my test model was mostly painted already so really it is only 14 Ashigaru and finally they may not be fully finished! I am considering doing some highlighting over the Ashigaru just to help them pop a little. The dip coat (as mentioned in my last post) does a great job, however I think I do prefer the hats to be painted up after to cover the varnish that inevitably pools on them. I think that I may also do a little extra whitening of the shirts and see if there may be a way to fix the sashimono staining. One other thing that I wanted to really note is how amazing Army Painter's Anti-Shine spray varnish is. I have used a few different Matt Varnishes in the past, sometimes over the top of a gloss varnish (which gives better durability). The problem with this method is that the matt varnish leaves a misty, blue tinted finish to the model. Not so with Army Painter's Anti Shine Matt Varnish spray! I am, unfortunately not being endorsed by Army Painter in any way (guys, if you read this I'd be happy to take some extra merch off your hands for some more favourable promos! ;-) ). 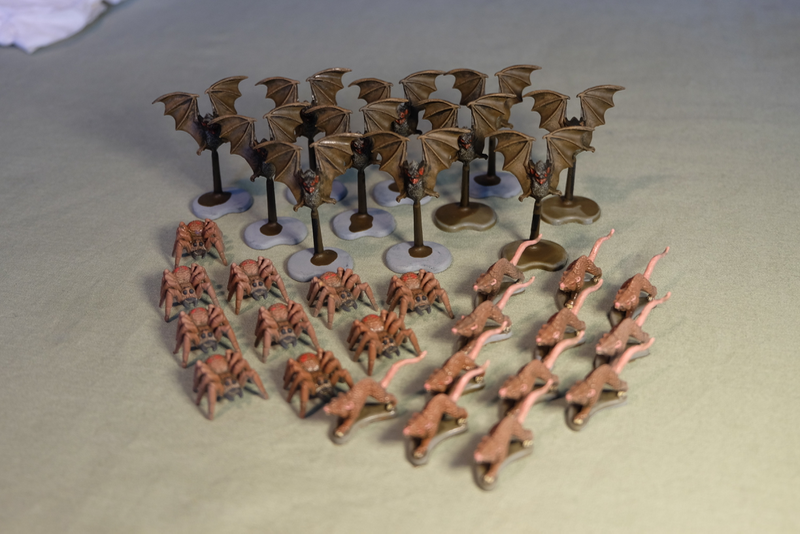 A while ago I was pretty damning of their starter paints as being too watery, and have had some issues with the finish of the color primers but the more I use these products, the more of a convert I become. They have taken a very intelligent and deliberate approach to developing their product line. Colour matching, spray varnish that works on top of their gloss etc, these are the things that a painter comes to really care about and it is starting to turn me around. GW's base coat paints may provide really good, easy coverage but for a high end finish, a few coats of Army Painter paints will do the job even better. This week I found some painting guides by Sam & Max on Board Game Geek for Zombicide and he is using the Army Painter sets with some additions. I have a little less than 500 zombicide miniatures in need of painting and I think that I may try some variant on the guides Sam & Max put out, possibly using exclusively Army Painter equipment and see where it gets me. One of the reasons for looking to go this route is that I think the dirty finish of the QuickShade will work well with post-apocalyptic and the flexible rubbery finish it gives should help ensure the paint stays on the soft plastic of the models! However I am going to have to make more of a dent on those blasted Samurai before that! I am thinking of tasking myself with painting 20-30/week once I am back from the UK... let's see if I hold to that! It may be that I don't have the space but it would be great to get another team painted up so soon after completing the Amazons!